Welcome to the home of the Boreal Prospectors Association, a regional member group of the Ontario Prospectors Association. The BPA has been established as a member group of the Ontario Prospectors Association. 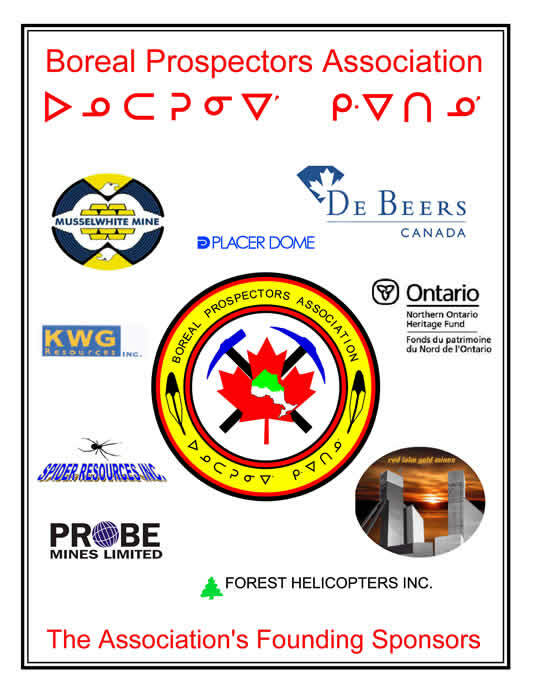 It is to provide a forum in which its members can discuss and address the many unique geographical, governmental and cultural challenges facing prospectors and exploration companies in northern Ontario. It is the intent of this Association to engage and support individual northern prospectors and to facilitate community-industry interaction by encouraging capacity building and mutual understanding. The BPA will represent and further the interests of its members in order to promote a sustainable mineral industry in Northern Ontario. The development of the association was proposed by northerners in an effort to encourage capacity building and understanding of the mineral industry in northern communities, improve engagement of the mineral industry with residents of the north and increase local participation in the industry. Everyone with an interest in benefiting from the economy of the mineral industry in northern Ontario should participate in the association. Individuals, community leaders and planners and those directly involved with the mineral industry all have an important role to play in this association. The Boreal Prospectors Association is run by a diverse group of individual volunteers acting as a Board of Directors. These directors are giving freely their time and making the effort to establish and direct this association because of a sincere desire to promote Economic Sustainability through Mineral Development in northern Ontario. The Board of Directors includes: Ivan Iserhoff, Russell Wesley, Douglas Parker, Dennis Bluecoat, Michael Fox, Ton Knijnenburg, Micah Winter and Mitchell Diabo. The Boreal Prospectors Association will promote prospecting and mineral exploration as an important economic element of sustainable development for Northern Ontario. The Association will act as a bridge to bring together the interests and voices of individuals, communities, industry and government through constructive dialogue of the mineral industry that promotes understanding and respect. The Association will enable prosperity through networking opportunities between members and the public and by actively providing information on education, training, employment and the business of mineral exploration. By providing a mechanism that encourages interested northerners to become part of the mineral industry, the Association will create a link between members that fosters mutually beneficial outcomes and environmentally responsible development with the participation, and to the benefit, of local communities. Contact us at BorealProspectors@hotmail.com for more information. Please show your support by becoming a member, attending the symposium or becoming a sponsor. Click here for the archived 2010 Far North Feast page. 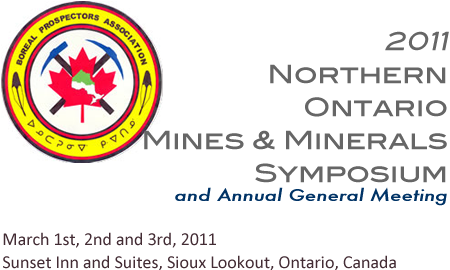 Click here for the 2009 Northern Ontario Mines & Minerals Symposium archive. Click here for the 2008 Northern Ontario Mines & Minerals Symposium archive. Click here for the 2007 Northern Ontario Mines & Minerals Symposium archive. Click here for the 2006 Northern Ontario Mines & Minerals Symposium archive.